Democrats know that Kamala Harris is a train wreck of staggering proportions. Yet, they prop her up as a leader in the party. They did the same thing to Elizabeth “Fake Indian” Warren, and look how that ended up. Warren skulks around DC in disgrace; a shell of the politician she used to be. Like Warren, Democrats fast-tracked the junior Senator from California. Harris sits on the Senate Judiciary Committee, a marquee spot. And Harris proved herself to be unworthy of the position during the Brett Kavanaugh hearings. While Kavanaugh’s future lay in the balance, Harris yucked it up with fellow Senator Cory Booker. All for the sake of a lying scumbag looking to profit off barely knowing Kavanaugh decades earlier. Perhaps it’s time to downsize the Senate Judiciary Committee. And in working class tradition, it’s last hired, first fired. Therefore, the Senate Majority Leader might eliminate Kamala’s seat. Now Democrats are scrambling to negotiate a deal. In fact, they’ve played the race card already. If Kamala loses her seat in the committee, she loses the spotlight. And believe it or not, neither she nor the Democrats care about her effectiveness. But they do care about her visibility. Believe it or not, the Republicans are doing her a favor, if they cancel her seat. Regardless, Democrats won’t think so. Despite Harris being a moron, they need her visible, if she is to be the sacrificial lamb for 2020. Thus, desperate Democrats beg Republicans to keep the committee at 21 members. If that doesn’t work, Democrats hope a more senior member will step aside. In short, Leftists want to keep the “only African-American woman” on the committee. For the optics, of course. Leftist remind America, “that the GOP side of the committee includes only white males.” Thus, Harris is needed…for the sake of DIVERSITY! Harris embarrassed herself during the Kavanaugh hearings, and not just with her childish antics with Booker. Her grandstanding proved that she cares only about building a reputation for herself. Currently, she’s known for sleeping her way into power. If reputation holds, we know why Democrats fast-tracked her. 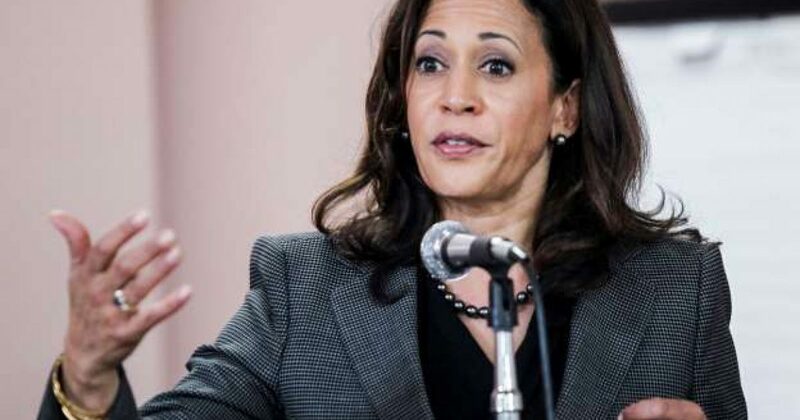 Recently Harris came under fire when she compared ICE to the KKK. It’s dangerous rhetoric, especially under today’s circumstances. Yet Harris peddled the idea of ICE being the same as the KKK. But the commentary didn’t really phase Kamala. She’s still #TeamObama through and through. In fact, she’s made a name for herself as one of the staunchest anti-Trumpers in DC. Between her Kavanaugh hearing mishaps and her comparison of ICE to the KKK, it’s not surprising that Republicans would like to do away with her seat all together. They’re tired of the fake news regarding investigations surrounding a false narrative. And there are way too many hands in the cookie jar. The only recourse left is to tell Kamala she’s out.